We’d love your help. Let us know what’s wrong with this preview of She Stood for Freedom by Loki Mulholland. Joan says, "Anyone can make a difference. It doesn't matter how old or young you are. Find a problem, get some friends together, and go fix it. Remember, you don't have to change the world ... just change your world." Filled with original photography, images of historical documents, and breathtaking artwork, She Stood for Freedom is a celebration of the effect a single life can have on the world. To ask other readers questions about She Stood for Freedom, please sign up. This is a powerful book on the Civil Rights Movement of the 1960’s. Joan Mulholland, a young white woman, joined the protest movement while in college and was present at every significant Civil Rights event. Joan was attacked and jailed for her conviction that “all men are created equal”. Her story is one that should be shared with all children and her message is still pertinent in today's troubled society: "Anyone can make a difference. It doesn't matter how old or young you are. Find a problem, get some friends together, and go fix it. Remember, you don't have to change the world ... just change your world." A terrific book for children Grade 2 and up, She Stood for Freedom is sure to generate worthwhile discussion with your children. Highly recommended. I've been reading a ton of civil rights biographies written for kids lately (picture book through YA) and so if I say this is a perfectly serviceable civil rights biography written for kids, it's no slight on the book. It's solid. One thing I particularly noticed is its great use of primary source documents. Really punch you in the gut, they do, and make the story much more lively. I adore this woman! Fearless and driven, humble & kind, & embodies Americanism, Christianity, & righteousness. The 64 page version is the version I will buy for my middle school library. This was an interesting publishing phenomenon. Usually, we see really long nonfiction that may cover a person who made less than optimal life choices made into "Young Readers Editions" so we don't get all of the dirt on, say, Louis Zamperini's exploits in Unbroken. But to see a picture book version and one only 24 pages longer seems interesting. I ended up reading both, because our 7th grade is working to put together a Civil Rights unit and we were investigating biographies. I've included the ISBN numbers so if these look good, you get the right one for your library. Joan Trumpauer was raised in the South but felt from an early age that the way blacks were treated was unfair. Since she was a teenager when the Civil Rights movement in the 1960s was heating up, she got involved. Other white people gave her an especially hard time, and occasionally the blacks she was trying to help were wary of her, but she managed to be in a lot of important places with influential people. My school is predominately white, and there were some parents who complained that when we studied Civil Rights, there was no specific mention of "good white people". Interestingly enough, there are LOTS of fiction books from the point of view of white people who are sympathetic to the 1960s plight of black citizens. We need a LOT more books on various facets of the Civil Rights Movement. It was very difficult to find resources when we were doing the unit. This story centers around Joan Mulholland, a white woman who grew up in Virginia in the 1950's who was passionate about the Civil Rights Movement. She was committed to do what she could and never backed down, whether her life was in danger or she wound up in jail. I read this book with my children and, even though it's not very long, it took us a while to read because we had some great discussions along the way. It's filled with short stories about some of Joan's experiences, with photos and type This story centers around Joan Mulholland, a white woman who grew up in Virginia in the 1950's who was passionate about the Civil Rights Movement. She was committed to do what she could and never backed down, whether her life was in danger or she wound up in jail. I read this book with my children and, even though it's not very long, it took us a while to read because we had some great discussions along the way. It's filled with short stories about some of Joan's experiences, with photos and typed or handwritten documents and letters to give a better feel for that time period. It was interesting to read about some of the historical events from her perspective. There were some stories that I wish had been a little longer. It's an inspiring read with a great message! Joan felt like an ordinary woman that saw a problem and decided to make a difference. I love her final line: "Remember, you don't have to change the world...just change your world." My sorority chapter read this book as part of our national reading incentive. Joan Trumpauer Mulholland, the subject of this book, was the first white woman to become a member of Delta Sigma Theta Sorority, Incorporated, my sorority. Her son Loki, the author, joined our virtual book club discussion of the book. We had a lively and enlightening discussion. Loki is an engaging book club meeting participant whose love for and pride in his mother are most evident and well-deserved. Joan Trumpauer Mu My sorority chapter read this book as part of our national reading incentive. Joan Trumpauer Mulholland, the subject of this book, was the first white woman to become a member of Delta Sigma Theta Sorority, Incorporated, my sorority. Her son Loki, the author, joined our virtual book club discussion of the book. We had a lively and enlightening discussion. Loki is an engaging book club meeting participant whose love for and pride in his mother are most evident and well-deserved. This book is a biography of the life of Joan Trumpauer Mulholland. Mulholland was a white woman who grew up in the south during the Civil Right's Movement. When she was young she visited the black part of town and saw how different the black schoolhouse was to her school for whites. This ignited a spark in her and she knew she had to do something. This was the start of her changing lives. After graduating high school she attended an all black college, participated in demonstrations, was a freedo This book is a biography of the life of Joan Trumpauer Mulholland. Mulholland was a white woman who grew up in the south during the Civil Right's Movement. When she was young she visited the black part of town and saw how different the black schoolhouse was to her school for whites. This ignited a spark in her and she knew she had to do something. This was the start of her changing lives. After graduating high school she attended an all black college, participated in demonstrations, was a freedom rider, and even was arrested. She fought for what she believed in. This book has very unique illustrations. The illustrations are a collage of pictures and sketches. Some of the drawn in faces are blue, which gives the illustrations an erie feel. This a children's book written for little kids. This woman's legacy deserves a full adult style book about all her accomplishments. What a shame. If you have a child it is a 5star read. Don't waste your money eye of you are an adult. 5 stars if you read on a 4th grade level. It is a shame that this woman's legacy did not garner a full length book about her life. This new biography of a civil rights 'freedom rider' is accessible to young children and adults. We have two version and one is filled with photos and the other sticks with illustrations. I had not heard of her before, and many in her family disproved or didn't know her full story. Civil rights stories are always inspiring. Interesting story of a woman who chose to do what is right, no matter what. Very good book. I had often seen Joan Trumpauer’s photo in the Freedom Rides literature but never knew her story. It is great to “know” her now! I didn't find this quite as compelling as I wanted it to be until nearly the middle of the book. By the end I was moved. The art is beautiful. I love the stylized look of an image over an image. She Stood for Freedom was fantastic. I had already burst into tears on the first page- actually, the introduction. I burst into tears at least 3 more times while reading. The story is just so powerful, and it was full of so many surprises. Spoiler: Joan is the girl in that famous lunch counter photo. She was at every big event in the Civil Rights Movement in the 60s: Freedom Rides, March on Washington, Sit-ins, Jail-ins. The full title of the book is: “She Stood for Freedom: The Untold Story of She Stood for Freedom was fantastic. I had already burst into tears on the first page- actually, the introduction. I burst into tears at least 3 more times while reading. The story is just so powerful, and it was full of so many surprises. The full title of the book is: “She Stood for Freedom: The Untold Story of a Civil Rights Hero, Joan Trumpauer Mulholland.” I’m so glad I got this book from my school’s media center, and I can’t wait to give this book to every kid over age 8 (I’ve decided this book is OK for ages 8 and over since no violence is shown, although some scary scenes are described… so maybe age 9). What sticks out to me the most about this book is how SHAMEFUL it is that such YOUNG people- 19 year olds!- had to fight for the freedom of American citizens to claim their basic rights of voting and safety. The Civil Rights Movement took at least ten years. Brown vs. Board of Ed was passed in 1954, yet schools were still segregated all over the south in 1964. The Civil Rights Act (outlawing discrimination? Really? How was that not already part of the law?!?) was passed in 1964, according to the helpful timeline in She Stood for Freedom. The Montgomery Bus Boycott started on December 1, 1955. Ten years later the Voting Rights Act was passed in 1965. We had to fight this hard to get people basic respect and rights? That was only 50 years ago. Only 52 years ago, the Civil Rights Act was passed. We SHOULD worry about if we are actually treating all Americans equally today. We SHOULD worry about how much racism still remains. This country was BORN with- it was built on- racism. If you read Cherow’s bio of Hamilton, you know this. Jefferson could NOT agree to Hamilton’s vision of a strong central government-- the one we have today-- because he had to protect Virginia’s right (HA! A RIGHT!) to own slaves. I mean, I went to the dude’s school, and did not fully realize what a total jerk he is until I read Hamilton. He looks vindictive in Hamilton: An American Musical, but in Chernow’s book, he looks like a… hmm I don’t want to say monster, since I walked his beautiful Academic Village for 5 years and learned so much there… but he looks like a… weak little jerk. But listen TJ, I love your school (let me guess- built by slaves) and pretty Monticello (let me guess- built by slaves) and I thank you for what I learned there and who I met there, and especially what I learned about African-American history there. You did a good thing by establishing a place to learn in that beautiful town. We learned ourselves right into our first black President, sucka! In the late 1950s and early 60s, Joan Trumpauer was a teenager living in Virginia. The times were turbulent in the South, as court decisions went against the “separate but equal” mindset of race relations, and schools and other venues were ordered to integrate. Joan was white, but she believed that everyone should be treated equally. As she grew older, she participated in the Civil Rights Movement, getting arrested and beaten time and again. 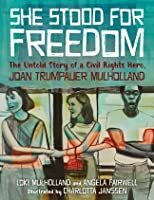 She Stood for Freedom: The Untold Story of a Civil Righ In the late 1950s and early 60s, Joan Trumpauer was a teenager living in Virginia. The times were turbulent in the South, as court decisions went against the “separate but equal” mindset of race relations, and schools and other venues were ordered to integrate. Joan was white, but she believed that everyone should be treated equally. As she grew older, she participated in the Civil Rights Movement, getting arrested and beaten time and again. 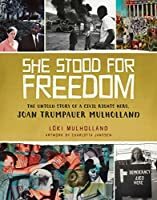 She Stood for Freedom: The Untold Story of a Civil Rights Hero, Joan Trumpauer Mulholland, tells not only the experiences of one person, but also of the struggle that gripped the South during those years. It’s difficult to understand how Americans, black and white, were dragged from barstools at diner counters and beaten simply because they believed it was unjust to treat one race inferior to the other. The dangers were real, as quite a few people working to create change were murdered for their actions. Joan continued to work for the cause even after she married and started a family. In a poem she wrote for herself to explain what she did, Joan wrote in part that she did “nothing but act like an American,” who was a Christian and had read the Declaration of Independence. She Stood for Freedom is written by Joan’s son, Loki Mulholland, and it contains artifacts she kept from the time, including a letter written by her jailer in Mississippi to her mother, questioning how parents could allow their daughter to act the way she did. It’s all very sobering in an age appropriate way. Readers 9 to 12 will learn more about this recent period in American history. This book and a companion picture book for younger children were both illustrated by Charlotta Janssen. The images as well as old photos, flyers, and more, evoke the times and should inspire interest in this movement that still resonates in issues today. There has been a big push lately for social studies classes to use primary sources when studying various events and individuals. Books such as She Stood for Freedom help to meet this demand by combining a narrative with images of historic photographs, newspaper headlines, informational flyers, and even diary entries. The narrative is broken into easily readable chunks, which all have headings to make it easy to find what the reader needs. The description of what Joan and her fellow Civil Rights There has been a big push lately for social studies classes to use primary sources when studying various events and individuals. Books such as She Stood for Freedom help to meet this demand by combining a narrative with images of historic photographs, newspaper headlines, informational flyers, and even diary entries. The narrative is broken into easily readable chunks, which all have headings to make it easy to find what the reader needs. The description of what Joan and her fellow Civil Rights workers endured as they staged sit-ins, freedom rides, and other demonstrations is clearly told without dwelling on morbid details. The combination of straightforward description and visual images makes a book that can be used with middle grades and up to support lessons on the Civil Rights Era. The book also has a Civil Rights Timeline and original artwork by Charlotta Janssen. For those who have not heard of her, this is a wonderful introduction to the life and work of Joan Trumpauer Mulholland. The book covers everything from her childhood in Virginia and trips to visit relatives in Georgia, to her time working for Civil Rights and her later marriage and career. There are photos of Joan as a child, as a young adult during demonstrations, and even a mug shot from her arrest as a Freedom Rider. I particularly like the closing section, "An Ordinary Hero." The explanation that Joan never saw herself as a hero, but only as someone doing the right thing is a great idea to leave young readers with as they finish the book. Her simple explanation, "When something is the right thing to do, DO IT! It's that simple," can be used a starting point for meaningful discussions. Highly recommended for middle grades and up. I received an advance copy of the book for review purposes. 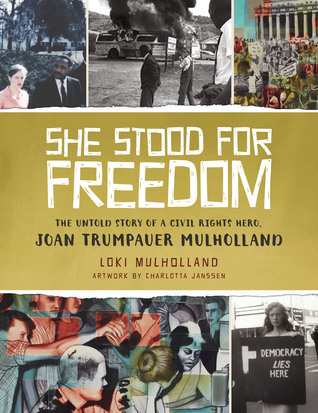 She Stood for Freedom tells the story of Joan Trumpauer Mulholland, a Civil Rights activist. Joan participated in sit-ins, was part of the Freedom Riders, met Martin Luther King,Jr. and was arrested multiple times for her work in the Civil Rights Movement. I’m not sure what to think of She Stood for Freedom. The book focuses on an important time in American history. But the story itself feels disjointed. It begi I received a copy from the publisher via NetGalley in exchange for an honest review. I’m not sure what to think of She Stood for Freedom. The book focuses on an important time in American history. But the story itself feels disjointed. It begins with a ten year old Joan traveling to her grandmother’s house in Georgia. I thought this was going to be the way the book progressed: highlighting events in Joan’s early life that shaped who she became, and then focusing on her Civil Rights Work, progressing from one event to the next. Instead, the book jumped around in her life and at times seemed more like an encyclopedia of Civil Rights terms and events than a biography of an individual. As a librarian, I’m not sure if I would recommend this book to a child looking to do a report on an individual who was active during the American Civil Rights Movement. This book wouldn’t fit that kind of need. However, She Stood for Freedom is a good resource about the Civil Rights Movement as a whole. The pictures included in the book give young readers an accurate portrayal of how conditions were for those involved with Civil Rights. At the same time, content remains appropriate for the book’s intended audience. There are primary resources referenced throughout the book, which I always like to see. Wonky title aside, She Stood for Freedom is a strong nonfiction book for middle grade kids. It follows the life of Joan Trumpauer Mulholland, from the time when she was a young white girl growing up in segregated Virginia and Georgia in the 1950s, through her experiences during the Civil Rights Movement in Virginia and Mississippi in the 1960s, and ending in her adult years back in Virginia. The text is a fairly easy read and a lot of the potentially foreign concepts (sit-ins, jail-ins, freedom Wonky title aside, She Stood for Freedom is a strong nonfiction book for middle grade kids. It follows the life of Joan Trumpauer Mulholland, from the time when she was a young white girl growing up in segregated Virginia and Georgia in the 1950s, through her experiences during the Civil Rights Movement in Virginia and Mississippi in the 1960s, and ending in her adult years back in Virginia. The text is a fairly easy read and a lot of the potentially foreign concepts (sit-ins, jail-ins, freedom rides) are thoroughly explained. What fascinated me most were her recollections of her years spent in Mississippi and that is where the majority of the narrative lies. It gave me chills reading about events that took place in my state; I think this will make an excellent supplement to some Mississippi History classes. Mulholland's experiences at sit-ins, at Parchman (nearly as notorious today as it was 50 years ago), and during Freedom Summer were enthralling. The people with whom she rubbed shoulders read like a who's who of the CRM in my state: Medgar Evers, Fannie Lou Hamer, Amzie Moore, Aaron Henry... There are a ton of pictures of memorabilia from the time period, as well as pictures of Joan and her friends/fellow activists. We're forever indebted to all of them for the progress that they forced into Mississippi. This is the very first ARC I've received from Edelweiss. What fun! I received this book as an ARC from the publisher through NetGalley in exchange for an honest review. This book is for children in the middle grades, but can be of interest to both teens and adults, who want a simple and basic introduction to the Civil Right Movement. Being that this book was an ARC, an Advanced Reader Copy, this book had not yet been edited and the formatting was very much off. At times, it was a little difficult to follow since the text was on a different page, than the text u I received this book as an ARC from the publisher through NetGalley in exchange for an honest review. In the 1960s, Joan Trumpauer Mulholland participated in sit ins, marches, jail-ins, Freedom rides, and served time in jail. Illustrated with photographs and artifacts from the Civil Rights era and Joan's life, this biography by her son, Loki Mulholland, provides an excellent introduction to the time period, and the bravery of the protesters who risk their lives to end segregation. I recommend this book highly. It is beautifully written and illustrated and brings to life the young white teenage gi In the 1960s, Joan Trumpauer Mulholland participated in sit ins, marches, jail-ins, Freedom rides, and served time in jail. Illustrated with photographs and artifacts from the Civil Rights era and Joan's life, this biography by her son, Loki Mulholland, provides an excellent introduction to the time period, and the bravery of the protesters who risk their lives to end segregation. Despite growing up in the segregated South, Joan Trumpauer Mulholland recognized the segregation surrounding her was wrong and she took steps to change things. From marches and sit-ins to attending a historically black college, Joan walked the talk. This book highlights the ways she participated in the Civil Rights Movement, but the most inspirational part for me is a line that comes from Joan years later. "It doesn't matter how old or young you are. Find a problem, get some friends together, an Despite growing up in the segregated South, Joan Trumpauer Mulholland recognized the segregation surrounding her was wrong and she took steps to change things. From marches and sit-ins to attending a historically black college, Joan walked the talk. This book highlights the ways she participated in the Civil Rights Movement, but the most inspirational part for me is a line that comes from Joan years later. "It doesn't matter how old or young you are. Find a problem, get some friends together, and go fix it. Remember, you don't have to change the world...just change your world." This is a short but powerful true story. During the 1950's and early 1960's the civil rights movement was very big. This book tells of a teen growing up during the civil rights era , who just wanted everyone to have the same rights and that no one would be discriminated because of race or religious affiliation. She made friends with, marched beside, was jailed and went to sit ins to prove a point. She also went to a university that wasn't seg I received this book in exchange for an honest review.